Everett, Washington (CNN) -- The Boeing 787 Dreamliner sparkled Saturday in rare Pacific northwest sunshine as the plane made its long-awaited debut. Three years overdue and billions of dollars over the budget, Boeing will finally deliver the 787 Dreamliner to Japan's All Nippon Airways next month in Tokyo. The plane is scheduled to be the first to carry commercial passengers in the 787 Dreamliner series, which has been plagued by delays but promises to revolutionize air travel. "We are rolling out the first delivery airplane, the first 787. That's an amazing thing for those who have worked on the program five, six, seven years, here at Boeing and our partners around the world," said Scott Fancher, Boeing's vice president and general manager of the 787 program. The plane is the first commercial airliner to be made mostly of carbon composites or super durable plastic. Those materials mean a lighter plane that Boeing says could use 20% less fuel than conventional airliners, making way for a more environmentally-friendly and cost effective aircraft option for airlines. 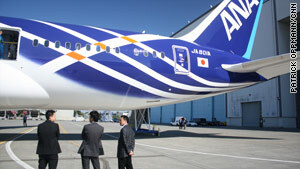 A view of the tail section of the new Boeing 787 shows the paint job used by All Nippon Airways. So far, according to Boeing, the manufacturer has more than 800 orders for the 787 Dreamliner, which has a list price of about $200 million per plane. The interior of the plane also sports a variety of upgrades. Gone are traditional plane window shades. Instead, a button on the window allows passengers to gradually darken their surroundings. Boeing is developing two Dreamliners. The first version, the 787-8, holds 210 to 250 passengers on routes. A second version, the 787-9, holds 250 to 290 passengers and is designed for longer international routes. All Nippon Airways has ordered 55 Dreamliners and Mitsuo Morimoto, the airline's senior vice president, said the airline will develop new routes around the Dreamliner's capabilities. "We plan to use the 787 to expand our business, particularly our international routes. We plan to increase our revenue from international route significantly and the 787 will play an instrumental role in this," Morimoto said. The airline is considering a route from Japan to the U.S. or Europe that would employ the 787 Dreamliner, Morimoto said. All Nippon Airways' flight attendants pose in the cockpit of a new Boeing 787 Dreamliner on Saturday. Despite the 787 Dreamliner's revolutionary promise, Boeing has struggled to manufacture the plane. The future of a new assembly plant in South Carolina is also in doubt. Boeing's machinist union accuses the manufacturer of putting the plant there rather than in Washington state to take advantage of South Carolina's weaker labor laws. The National Labor Relations Board has threatened to shut down the plant. To meet demand for the new plane, Boeing said it will need to increase production of the plane from two 787 Dreamliners a month to 10 a month by the end of 2013. "It's an extraordinary challenge, no one has ever built a wide body aircraft at the rate of 10 per month before. So I think Boeing has its work cut out for it," said John Ostrower, a writer for Flight International Magazine. "I would say the biggest challenge is as they head into this ramp up is making sure 787 is as profitable for themselves as they hope it will be for their customers," Ostrower said. The airline will inaugurate the 787 Dreamliner on a special charter from Tokyo to Hong Kong this fall, the company said.